January 2019 - Noura had no prior pastry experience before coming to Le Cordon Bleu Paris. She first took the Boulangerie Diploma, and then decided to continue with the Pastry Diploma. She tells us what life at Le Cordon Bleu Paris looks like. Can you introduce yourself and tell us what you have done before studying at Le Cordon Bleu Paris? I’m 20 years old, and I’m Lebanese. Before studying here, I did one year of psychology at The American University of Beirut in Lebanon, until I realized that wasn’t where I wanted to be and what I wanted to continue the rest of my life doing. What made you want to study at Le Cordon Bleu Paris? Why did you choose Pastry? I chose Le Cordon Bleu for its well-known reputation, and because I knew about how students come from all around the world to study here. I chose pastry because it is what I am passionate about and it has always been a dream of mine to become a Pastry chef. Where is the best place I could learn French pastry rather than France itself? What level did you have in pastry before starting your Diploma? I had absolutely no experience in Pastry before coming to Le Cordon Bleu. Actually, I have never even been in the kitchen before I came here. I did the Diplôme de Boulangerie here before I started with Pastry. But I had no experience before this, I’ve always wanted to and always been interested in trying things out at home, but I never really had the time. I would watch videos and TV shows all the time though, that’s how I knew I was so in love with it. Tell us how a typical day in class looks like? A typical day in class, I arrive at least 45min to 1 hour before my class, I don’t like to be in a rush. After getting into my uniform, I go wait in front of our class. In demonstration, the Chef shows us how to make the specific pastry that we have for that day. We listen, take notes, and ask any questions we may have. After our demonstration class we go to the kitchen to perform what we were shown in demo. I have been at Le Cordon Bleu Paris for almost 9 months and time really does pass so fast when you’re doing something you love and are passionate about ! I have around 6 months left, and I really can’t believe it, part of me doesn’t want it to end. I really don’t know where to begin, not to mention everything I have learnt in pastry, I have learnt how to always be on time, how to work in groups and communicate with others, and most importantly how to be fast but work properly. There are things I never knew about and every day I would learn something new... It really is very interesting. I’m more curious every day to pick up more information from our Chefs. I’m very proud of how I have improved with my time management and organization. It was what I was most worried about when I started studying here, everything moves so fast in practical class and I thought I could never keep up, but now I can! It’s a hive of activity! Everyone’s so busy working on what we should present, however, we all help each other if anyone needs it. After I graduate I plan on doing the Diploma in Culinary Management at Le Cordon Bleu London and then go to Tokyo for ice cream courses. After that, I’ll work for a few years before opening my own Tea Salon in Dubai, UAE. 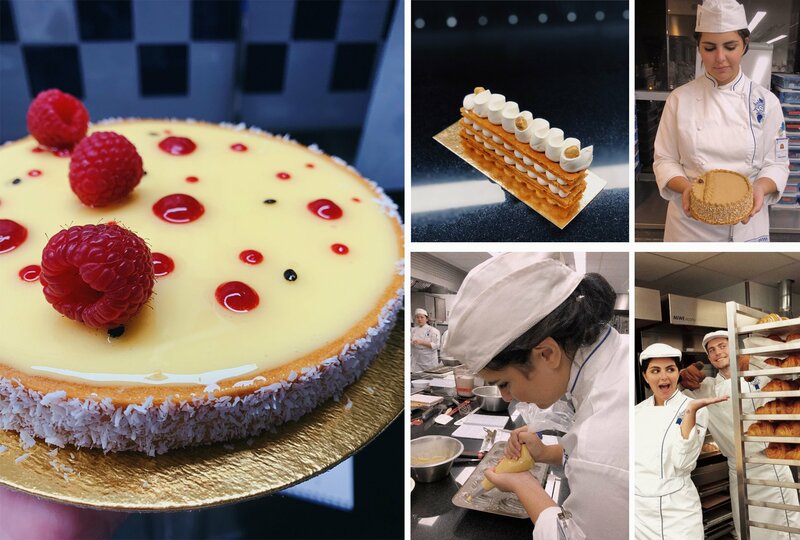 Follow Noura's journey at Le Cordon Bleu Paris by clicking here.